There is An English BIO after Japanese sentence. His 21 years of “the road to Hatha yoga” started in 1995. He studied under famous yogi Br. Rudara in Rishikesh, India for 16 years to master B.K.S Iyenger yoga system. 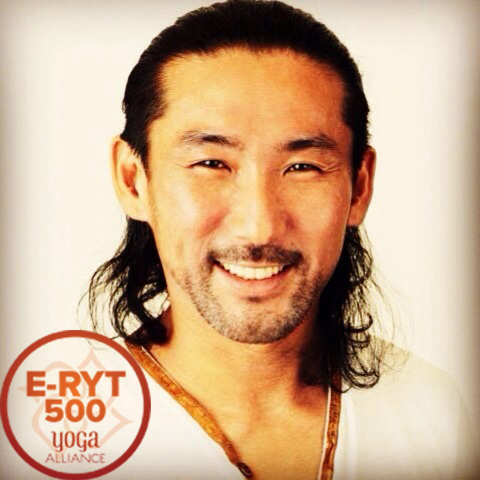 In 2005, he established “Vaikuntha Yoga Okinawa”. In 2006, he created medical based Vaikuntha Yoga as he wished to people practice yoga as they brush teeth everyday. He invented new and original method based which is composed with safe asana by using props and is based on yoga anatomy and the Vaikuntha yoga expands all over in Japan rapidly as the new style of yoga. Not only when you do yoga but all of the scene in life is yoga, and He learns chaotic true yoga theory from Indian tale and quiet yoga sutra and his observation of yoga and lecture is highly recognized as it could even change a life of someone who study yoga. He is also specialized in the world of sound , Nada Yoga(yoga of sound)and known as yoga musician, started『Tantric Yoga Band “VAIKUNTHAS”』in 2006. In this band as『the main concept is yoga, and combined Indian classic music and electronic music organically』,he is a producer, composer and plays Shurti box, works and collaborate with musician from all over the world. They released their first album in fall of 2015 followed by their second album『Light on Yoga Nada』, the concept is “Music for Yoga” released in June, 2016. It stayed as top selling album in yoga music store for long period of time, and they are called as a pioneer of yoga music in Japan for their high music performance. In 2014, he organized Okinawa Satsang Yoga x Music Festival to suggest Yoga life style, which is to feel oneness with earth. He provides『 the open opportunity for everybody to meet yoga』. Even now as he holds a name of top yoga instructor in Japan, he believes in『Yogi is who continue to study 』and goes to India every year to study under his guru Br. Rudara to master the true nature of Hatha yoga and he is a true yogi who keeps updating himself. As said above, his every action is based on yoga and released to the world.